Has a company associated with a United National Front cabinet minister been awarded contracts for two road rehabilitation projects which will cost the taxpayer Rs 3.6 billion? Insiders say the company has been under the minister’s name. Since they began bidding for projects under the present Government, the name has been changed and overall management responsibility placed with a member of his family. Insiders reveal that the minister himself sat at the ministerial meeting just days ago where these two contracts, together with a few others, were given approval. One project is a joint venture to rehabilitate 89 kilometres of rural roads at a cost of over Rs 1.81 billion. This sum is without taking into consideration the Value Added Tax (VAT). The other project is for the rehabilitation of 94 kilometres of rural roads, also together with another firm, at a cost of over Rs 1.817 billion. Here again it excludes VAT. In accordance with good governance or yahapalana principles, ministers are expected to declare their conflict of interest when contracts are awarded. The question being raised is whether this requirement was followed when the minister concerned sat at a ministerial meeting to give approval to a family venture. A tug of war between two ministers – Vajira Abeywardena and Chandima Weerakkody – to locate a courts complex in areas they suggested has now been resolved. The Government will establish a new courts complex at Boossa. An extent of 26 hectares of land will be acquired for this purpose. 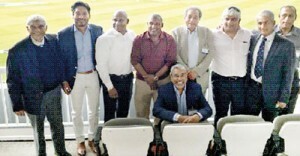 Our picture shows cricket commentator Ranjit Fernando, Kumar Sangakkara, Aravinda de Silva, Ajith Dias (SriLankan Chairman), minister Arjuna Ranatunga and Sidath Wettimuny. Seated is Suren Ratwatte, Chief Executive Officer (CEO) of SriLankan. Being in the throes of a deepening financial crisis did not prevent SriLankan Airlines from having a Flysmiles Hospitality Booth at the Lord’s Cricket Grounds. Food and drinks were free and cricket enthusiasts were treated to different delights. The occasion was the Sri Lankan team’s cricket tour of England where the third test match was played at Lord’s. It was only last week the national carrier suspended crews from overnighting on some distant flights as a cost cutting measure. More financial cuts are taking place in other sectors. The conduct of a senior Railway official became the subject of detailed discussion at a recent meeting of the Cabinet of Ministers. This was after the Presidential Commission of Inquiry “to Investigate and Inquire into Serious Acts of Fraud, Corruption and Abuse of Power, State Resources and Privileges” wrote to the Cabinet Secretariat. The Commission expressed concerns over the conduct of the official who is still in his post and is the subject of an inquiry. Ministers were told that his removal from an organisation like the Railway, “which is essential to public life might lead to disruption of service, causing inconvenience to the public.” Hence it was pointed out that it was necessary that the officer should be restrained from attending some functions assigned that will impinge on the ongoing investigations. Ministers were also reminded that since August 2014 (which was during the previous administration), suitable officers for positions like the one under discussion were selected by a Committee from those found suitable. They were impressed on the need to adhere to the practice even when making an acting appointment. The Cabinet of Ministers has decided that without the sudden removal of the official, an “operational strategy to address the concerns of the Government” should be formulated, in consultation with the Attorney General. In that meanwhile it has also been decided to identify some areas of responsibility assigned to this official and entrust them to another. That will enable the official under probe to only conduct day to day matters, it was felt. Earlier, the Government put a stop to state investigating agencies from arresting any senior Government official. Instructions were given to the FCID, CID and the Special Crimes Investigation Unit. This was after senior administrative officers warned that there would be a breakdown of the bureaucratic machinery. There were some moments of humour when former President Mahinda Rajapaksa chaired a meeting of parliamentarians of the “Joint Opposition” in a Committee Room in Parliament days before he left for Japan. Deputy Minister Palitha Thevarapperuma (UNP – Kalutara District) was rushing for some urgent business when he saw some opposition colleagues seated there. The door was ajar. Keheliya Rambukwella (UPFA – Kandy District) and Ranjith Soysa (UPFA – Ratnapura District) beckoned to Mr. Thevarapperuma to come inside. He walked in to see Mr. Rajapaksa chairing a meeting. “I am so sorry Sir, I did not know it was your meeting,” pleaded Thevarapperuma as he patted Mr. Rajapaksa on his shoulder. The former President was witty enough to tell the Deputy Minister that was no problem. He was still welcome to join the opposition. “Where will you ever get the opportunity to pat a leader on his shoulder,” he asked. After several months of debate, the Government has approved the purchase of 500 engine kits from two leading Indian manufacturing companies – Ashok Leyland and Tata. The move comes on a recommendation by the Minister of Transport Nimal Siripala de Silva. The Government has called for Request for Proposals (RFP) to set up an industrial zone and tank farm in Hambantota. Attractive concessions are to be offered to prospective investors, a Government minister said yesterday.